Gaslands Conversion Bits – Where To Buy? Not a single day goes by without someone asking on the Gaslands Facebook group where they can source bits and parts to convert their Hot Wheels, Matchbox or other toy cars into vehicles appropriate for the Gaslands recipe of dystopian future car combat. Below I list and comment on all of the sources of appropriate or nearly appropriate parts I have seen. My intention is this will be an evergreen resouce that I’ll add to over time. The list is divided by UK/EU and US/ROW retailers. Many ship globally but I know some people prefer not to pay or wait for international shipping. If you know of or operate a source of conversion bits that you think should be on this list, feel free to drop a note in the comments. Ostensibly the toy cars in common use are 1:64 scale (although see my note about scale accuracy). This is not a typical scale for wargames so sources for parts are not in abundance, and sometimes you may want or need to go “off-scale” slightly. Indeed, I’ve seen lots of great conversions using Games Workshop parts which nowadays is basically around 1:50 scale. In common with Games Workshop miniatures in general, such conversions tend to be on the over-exagerrated side. If that’s the look you like then good news, since GW parts are easily sourced from your/your friends/your club mates bits boxes and via the various well known bits websites. The list below however focusses on parts ranging from 1:80 (20mm scale) to 1:57.5 (28mm scale) which tend to fit best with Hot Wheels (again, see my note on scale for more about how 1:64 translates into a mm scale). Designers of a different 1:64 vehicle combat game called Autokill, this company manufactures accompanying weapons, crew, transfers and some vehicles including a bike mounted ganger. 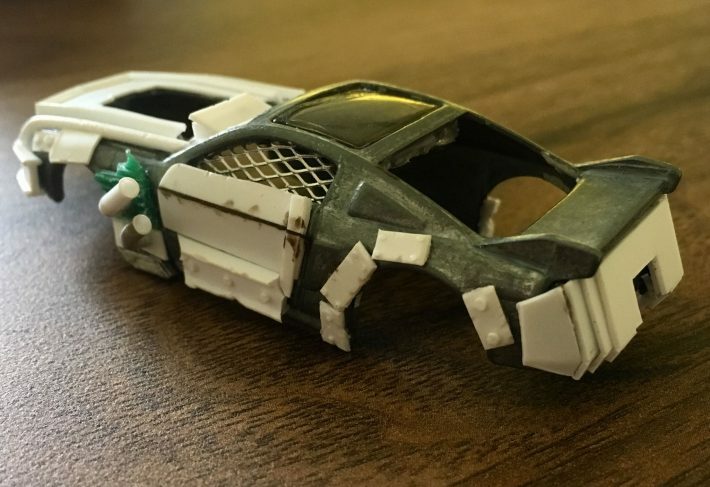 The setting of the game is very similar, and the parts are resin and look to be sculpted digitally so they are crisp and well detailed, making this a strong contender for bits although I have not seen them alongside any Hot Wheels cars to get an idea of their particular interpretation of “20mm” scale. Resin weapons designed specifically for Gaslands, covering almost all the options in the game. Has engaged with the Gaslands community which has led to several improvements of the products at launch including a reduction in scale so the final product looks great – finely detailed machine guns, mini guns, rockets, grenades, molotovs and more at a suitably small size. Based in Italy but with reasonable global shipping rates. My current standing recommendation – I would buy from here if I hadn’t already sourced weapons from elsewhere. And here are the designers of another 1:64 car combat game (nobody said Gaslands was entirely original!). Like Dice Mechanic Games, the similar setting and scale means the parts are highly appropriate. The store is mostly populated with full vehicle kits but their conversion set contains weapons, extra armour (including a “tombstone”) and useful looking accessories, in resin. Photographed with toy cars so you can see the scale. Principally on the list for the range of weapons, vehicle stowage, barrels, treads and so on. Being WW2/Cold War the weapons are almost all machine guns of one variety or another – useful to an extent for Gaslands though you won’t find gatling guns or flame throwers. The artillery range could be useful for the 125mm gun you can equip vehicles with, and there are also some vehicles and figures you may get some mileage out of although they are not particularly appropriate in my view. These are all 20mm “true scale” as opposed to heroic, so they are fairly small, and cast in white metal, which may not be a material that everyone wants to work with. Ramshackles’s small resin 20mm range consists of bikers and a car conversion set of crew, weapons, armour and rams. I have seen photos of the bikers next to Hot Wheels cars and to me they always appear far too small even though they are labelled as “perfect for use alongside toy cars” – be aware of this and do your own research. The conversion set looks excellent however, and being in resin instead of white metal is a big plus in my view. Note to non-UK players, the site says that shipping is free anywhere in the world. 28mm white metal weapons, equipment and (most of all) figures. The setting is a near future military one. Not a huge amount here for the typical Gaslands player, in my view, but if you are after 28mm soldier types then it could be useful. Resin weapons, I am a particular fan of their arnie minigun and infantry auocannon but beware of scale, the size is not given nor are the parts photographed next to anything, and the description as 28-32mm scale makes me think they’ll at least be “exaggerated” when used on Hot Wheels. Polish website. Ken does a line in resin wheels, weapons, bumpers, engines and generic parts and bits (Facebook links). These parts are custom made specifically for games like Gaslands so the scale and type of bits available is definitely appropriate. He does not have a website, so you will need to contact him directly on Facebook. Note: while he is based in the US, I have found the shipping rates to the UK to be entirely reasonable particularly if doing a bulk order. These are white metal figures and parts designed for an appropriate setting, that being “road warriors”, and come in both 20mm and 28mm. The 20mm Road Warrior range includes various figures on foot, a biker gang, a decent range of weapons and some armour upgrade parts. The 28mm range is more limited. The parts and figures are pretty old school but I know many Gaslands players have been very happy with their purchases from here. A South African site selling parts specifically for 1:64 die cast cars. This has a few different engine blocks and some miscellaneous accessories such as a nitrous canister and drag chute. The main specialism though is the wide range of accurate (and expensive) wheels and rubber tyres. These look to be designed more for modellers and collectors determined to get exactly the right wheels, but if that floats your boat, you know where to get them. A company that obviously believes the mantra of “do one thing and do it well”, this US site sells wheels and nothing else, but wheels in a bewildering array of colours and customisable sizes and lettering. Again, probably one more for modellers and collectors of die cast cars than Gaslands converters, but included on the list just in case.